The Elusive Austrian is a species that is apparently incredibly hard to hit on an NHL rink. One of the most derided statistics tracked by the NHL is the “hit.” This is for good reason – outhitting the opposition generally has no correlation to winning hockey games, what correlation it has at all is basically negative (more hits = less winning, mainly due to more hits meaning you have the puck less), and of course, home trackers are known to massively over-count hits for home teams, with certain rinks being particularly bad. But what about guys getting hit and avoiding getting hit? Just like Penalties, every play-by-play chart for each NHL game includes both the player doing the hitting and the guy who is being hit (like penalties taken and drawn). 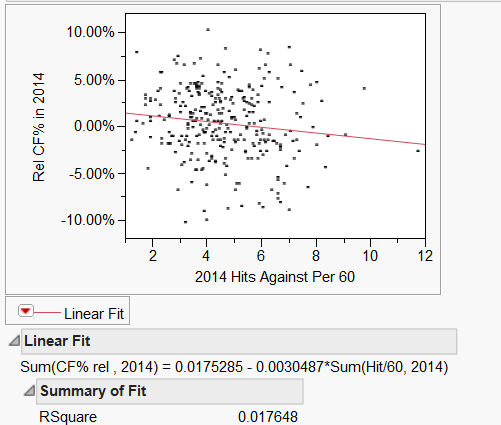 Extraskater now actually compiles hits against and hits +/- using these #s. Do these numbers mean anything? 1. Is avoiding getting hit a repeatable skill? 2. Is there a relationship between avoiding getting hit with increased scoring? 3. Is there a relationship between avoiding getting hit and winning the possession battle? 4. Do star players get hit more without an enforcer on the team? A quick caution: ExtraSkater doesn’t have road/home splits, so we can’t use Road Hits like we usually would. This is not as big of a problem I don’t think than with normal hits analysis, since home scorers are less likely to over-count hits against a player in a biased way as they do hits for, but obviously, it’s an issue. A quick look at the data reveals certain players on the same team all over the place in this statistic and no grouping of certain teams at one end of the chart, which is a good sign. First Off: Is Avoiding Getting Hit a Repeatable Skill? The above is a graph showing the hits against per 60 minutes totals of the 179 players who have played at least 43 games each of the last two seasons. As you can see, this seems to be a fairly repeatable skill – with an R^2 of .622. Players who avoid getting hit much in one year tend to avoid getting hit in the next year. There are a few players with decent size changes*, but for the most part, players stay in line – you see basically the same guys on the top (Grabner, Sutur, Weber, etc.) and bottom of the list (Andrew Shaw is the dude all the way in the top right corner of the graph) in each year. *A quick look at the guys who exhibit the biggest changes from year to year includes guys like Grabovski, Okposo, and Yakupov – aka guys who seem to have changed in roles this year. But even their shifts aren’t HUGE. If you look at the guys on the top of the list of “avoiding hits,” you see a bunch of pretty good players. Amongst forwards, you have Vanek, Joe Thornton, Tyler Johnson, Grabner, Brad Richards, Derek Roy, David Leglwand, Tyler Seguin, Shawn Horcoff, and Jiri Hudler make up the top 10, with the next 10 including Phil Kessel, Ryan O’Reilly, Claude Giroux, Paul Stastny, and Jason Spezza amongst others. But, that doesn’t necessarily mean there’s a correlation (or causation) there. A quick look seems to suggest that the relationship is small if anything. In 2014, the R^2 between these two #s was .184, in 2013 it was .197. These are stronger relationships than that of actual hitting and scoring, but not by much. 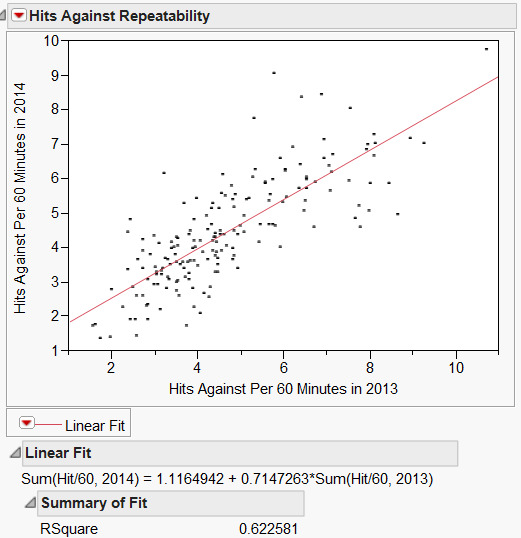 However, the relationship for out of sample data is much smaller – the 2013 hits against data only has an R^2 of .1268, which is actually smaller than that of the hits for data. 3. Is there a relationship between avoiding getting hit and possession? This question isn’t really going to be answered empirically (no correlations to run here). But the answer also appears to be no. Stars litter this list from top to bottom, whether or not they have enforcers playing every game (Phil Kessel is #16 this year with two of them) or some games (Vanek is #1 this year with Boulton playing 1/4 games) or not even any goons at all (Mikku Koivu was #1 last year without a goon, Ryan Suter is top 5 both years, Sidney Crosby is 38th this year despite being the best player on the planet and the guy everyone should want to kill). Meanwhile, Nazem Kadri one of the top 20% most hit players despite the protection of goons in both years. Really, it seems that style of play more than anything is what is the cause for some player getting hit a ton and others barely getting hit at all. Guys on the same line have wildly different hits-against rates – for example, Tyler Seguin gets hit under 2 times per 60 minutes (a top 10 rate), Jamie Benn gets hit around 4 times per 60 minutes, while Valeri Nichushkin takes over 6 hits per 60 minutes. Maybe enforcers make guys less likely to do dirty hits against your star players (I doubt that as well), but they certainly don’t seem like they reduce your hits against your star players very much. So if your star player is being clobbered a bunch (like a Nichushkin or Kadri), perhaps the place to look is your own player’s style of play, rather than a lack of protection. What a great idea for an article. Very cool. What about looking at avoiding hits and games played? i would assume guys who get hit less would injured less but would be neat to see the correlation.